Not on Facebook? Don't follow Twitter? No problem. We've now made it easier for you to follow TAMMACHAT's news through our SOCIAL MEDIA UPDATES with a preview right here on this blog and, in full, on our new RebelMouse page. 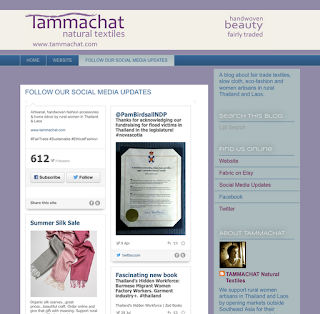 Just click on FOLLOW OUR SOCIAL MEDIA UPDATES at the top of any page on this blog. To read our latest blog post, SUBSCRIBE or FOLLOW BY EMAIL on the right side of this page. To receive our occasional e-news updates by email, click JOIN OUR EMAIL LIST on the right side of this page. Learn more about our work with women artisans in rural Thailand and Laos, be inspired by our customers' support building children's literacy in Laos (through Big Brother Mouse) and find listings of upcoming TAMMACHAT textile shows in Atlantic Canada. You can follow us directly too on Facebook, Twitter, and YouTube.